I just realized I've neglected all my (4) friends who read my blog! I am a horrible, awful, not nice person. But I'm pretty sure most of you already knew that about me. What can I say? But I have an excuse! 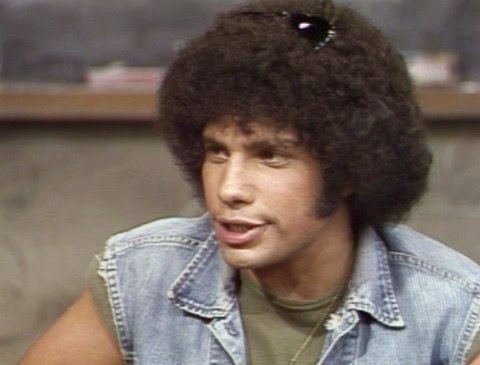 Sort of like Juan Epstein on Welcome Back Kotter (yeah I just really aged myself). The Baker Project was too busy doing really stupid things to keep in touch with her four followers. The Pope visited last night and things got out of hand. After all the hoopla died down she sort of forgot about writing because she got all "important" selling mascara and other stuff. Now she's selling Pampered Chef but since she likes to cook more than she likes worrying about how she looks (which is obvious because as I write this she is still in her bathrobe and it's after noon time) she promises to blog more and hustle less. Juan Epstein - Robert Hegyes. Sadly he passed away in 2012. So my promise for 2015 is to attempt to blog at least bi-weekly. Or maybe weekly. Probably not daily because that's just too much sass and angst for the internet to handle. I do have another blog I started for my PC business. No not politically correct but Pampered Chef. I've love if you could check it out and I will be linking recipes and ideas back and forth between the two. Alright I need to at least look like I give any craps today so time to but one some big girl pants and get moving. Thanks for hanging in their with me while I temporarily lost my mind. Yup I'm still selling the mascara so if you're so inclined go buy some. I love it and so will you. And yup that means I'm selling for two direct marketing companies but hey a girl has to make Benjamin's somehow and strip clubs tend to not hire flubby old mums. Or anyone without huge tata implants and I'm not spending my hard earned money on such novelty items.